One penny and two pence coins are legal tender only up to the sum of 20p; this means that it is permissible for a court to refuse payment of sums greater than this amount in 1p and 2p coins in order to settle a debt. 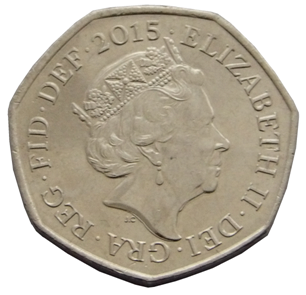 The two pence coin was originally minted from bronze, but since 1992 it has been minted in copper-plated steel due to the increasing price of metal. By May 2006 the pre-1992 (97% copper) coins contained 3p worth of copper each. As of May 2006, about 2.55 billion such coins remained in circulation. However, The Royal Mint warned that tampering with coinage is illegal in the UK. During 2008, the value of copper fell dramatically from these peaks. 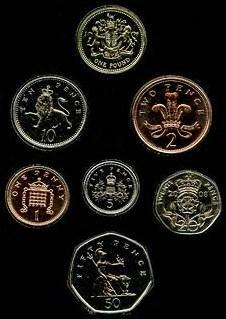 As of March 2014 there were an estimated 6.55 billion 2p coins in circulation corresponding to a value of £131 million. The original reverse of the coin, designed by Christopher Ironside, and used from 1971 to 2008, is the Badge of the Prince of Wales: a plume of ostrich feathers within a coronet, above the German motto ICH DIEN ("I serve"). The numeral "2" is written below the badge, and either NEW PENCE (1971–1981) or TWO PENCE (from 1982) is written above. However, a small number of 1983 "New Pence" coins exist. These coins are rather rare, and are considered collectors' items. It was originally planned that an alternative version of the 2p would be minted with a design representing Northern Ireland. These plans never came to fruition, however. The design was also re-cut in 1993 producing two minor varieties for that year. To date, five different obverses have been used: four different portraits and the removal of the beaded border in 2008. 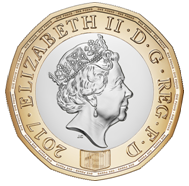 In all cases, the inscription is ELIZABETH II D.G.REG.F.D. 2013, where 2013 is replaced by the year of minting. In the original design both sides of the coin are encircled by dots, a common feature on coins, known as beading. Between 1985 and 1997 the portrait by Raphael Maklouf was used, in which the Queen wears the George IV State Diadem. In 1992 the metal used in minting this coin was switched from bronze to copper-plated steel. In August 2005 the Royal Mint launched a competition to find new reverse designs for all circulating coins apart from the £2 coin. The winner, announced in April 2008, was Matthew Dent, whose designs were gradually introduced into the circulating British coinage from mid-2008. The designs for the 1p, 2p, 5p, 10p, 20p and 50p coins depict sections of the Royal Shield that form the whole shield when placed together. The shield in its entirety is featured on the £1 coin. 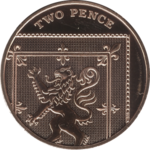 The 2p coin depicts the second quarter of the shield, showing the Lion Rampant from the Royal Banner of Scotland, with the words TWO PENCE above. The coin's obverse remains largely unchanged, but the beading (the ring of dots around the coin's circumference), which no longer features on the coin's reverse, has also been removed from the obverse. ^ a b c d "1p Coin". British Royal Mint. Archived from the original on 2006-04-27. Retrieved 2006-05-23. ^ Poulter, Sean (29 June 2009). "Have you a 20p worth £50 in your pocket? Royal Mint error results in undated coins". Daily Mail. Retrieved 29 June 2009. ^ a b c Clayton, Tony. 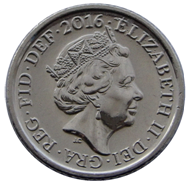 "Decimal Coins of the UK – Two Pence". Retrieved 2015-01-18.